The other day I've found paleo spaghettis in a specialty store down the street from where I live. I decided that my uber-expensive spaghettis deserved a 5-star sauce to go with, so...Bolognese sauce. 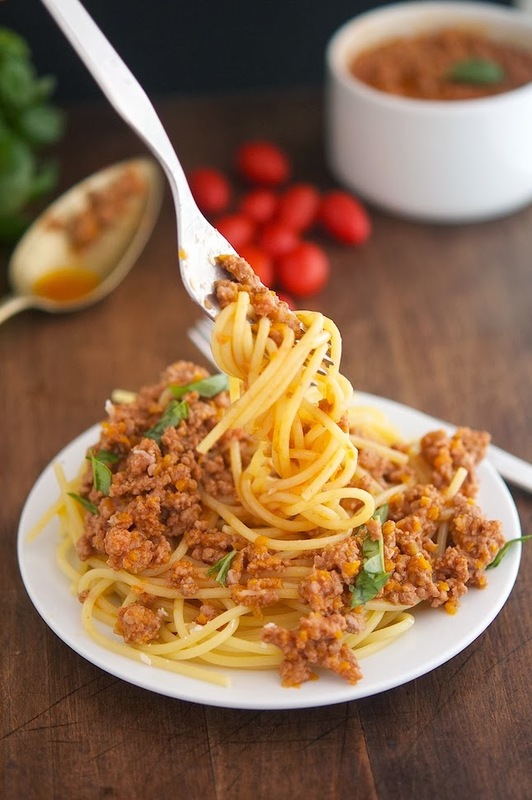 You guys know that this traditional Italian meat sauce is called Bolognese because it originates from Bologna in Italy? Ok, probably you do. 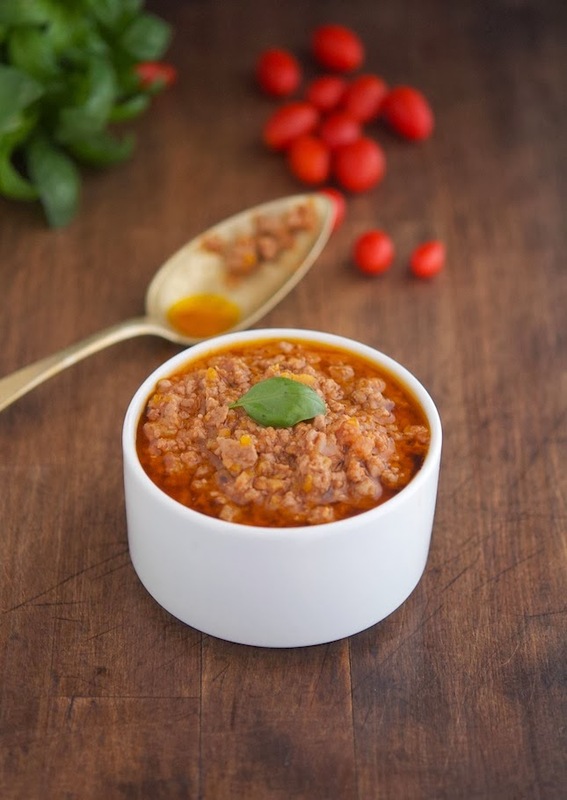 But, do you know that there’s only one original recipe for Bolognese sauce, deposited with the Chamber of Commerce in Bologna? I didn’t know that either, but my friend Francesca told me all about it. Apparently, in 1982, the Italian Academy of Cuisine recorded and deposited a recipe for "Classic Bolognese Ragu" with the Bologna Chamber of Commerce. I visited the Italian Academy of Cuisine website and I found the recipe (actually I found two, but whatever). With the help of Google Translate - which wasn’t at peak performance with this one - I managed to get the one and only original recipe for Bolognese sauce. YAY! I’ve made this recipe for quite some time already and it’s a total winner. Everybody seems to love it (except for my vegetarian + vegan friends — sorry guys). It's full of depth and so delicious. I recently adapted it for the Crock-Pot and came out perfectly, with minimal effort. A big high-five to technology! So, back to my paleo spaghettis. They’re made with tapioca, almond flour and a couple of other ingredients. So far so good. They smelled awesome while I was cooking them. And they also looked pretty good (I mean look at those pictures). They also tasted ok, but the texture...my oh my...like jellyfish. I kept chewing and chewing and chewing. I felt like a ruminant; which is probably good exercise for jaws, but I don’t want my pasta to be like that. I guess that for now I’ll just stick to spaghetti squash or if I feel like having pasta, I’ll just have real proper whole wheat pasta. Period. 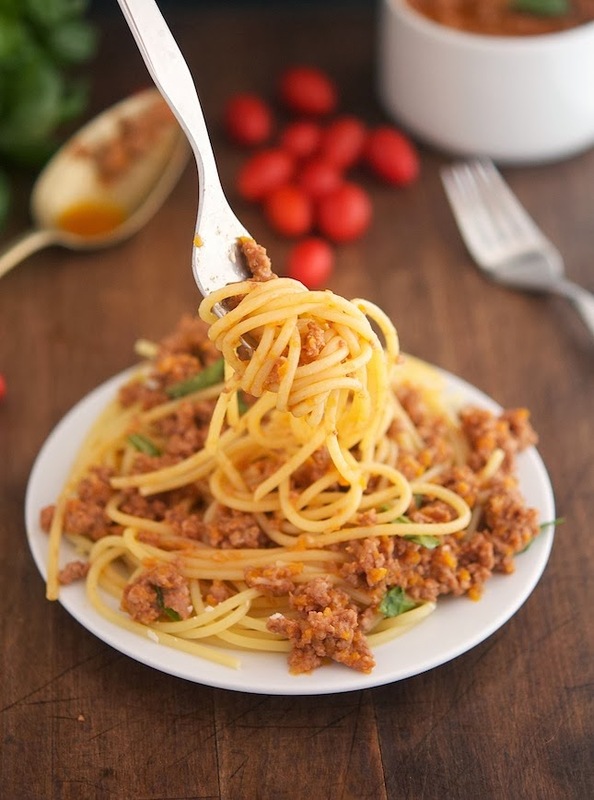 Crock-Pot Bolognese Sauce Print this recipe! Notes. This sauce starts out on the stove, which is essential to brown the meat then slowly simmers in the Crock-Pot for the rest of the day. If you don’t own a Crock-Pot, you can cook it on the stove, as long as you keep an eye on it. Make sure to visit your butcher for good quality meat before making it. I always recommend to buy grass-fed and organic meats. If you live in NYC take a trip to Fleisher’s in Park Slope (Brooklyn), it’s so worth it. In a large deep frying pan, sauté pancetta on low heat until the fat melts, about 4 minutes. Add olive oil, onions, celery and carrots and cook on medium-low heat until soft, about 8 to 10 minutes. Increase heat to medium-high; add meat (beef and pork), season with salt and pepper and sauté until browned, stirring every so often. Drain some of the fat (I usually just take a spoon and "spoon out" the grease into a bowl), then add red wine and cook until it reduces down, about 3 to 4 minutes. In the meantime, in a small bowl dilute the tomato paste with two tablespoons of beef stock. Add meat, diluted tomato paste, 1 cup of beef stock and milk to Crock-Pot. Cover and set slow cooker to low 6 hours. If you don’t own a Crock-Pot, add remaining ingredients to the saute’ pan, reduce the heat to lowest settings, cover with a lid and cook for about 2 hours. When finished cooking, adjust with seasoning and serve. Leftovers can be frozen for future meals. To reheat, thaw in the refrigeration then reheat on the stove adding a bit of water if it looks too dry. One cup yields 375 calories, 23 grams of fat, 9.6 grams of carbs, and 36.5 grams of protein. Great recipe and amazing pictures too! LOL, Mike. I hear you. 2. Amazing simple recipe. Love crock pot meals! 3. One time I bought those tofu spaghetti, in water, 0 calories. Oh my...gross. I'd rather eat real thing like you. Hahaha Olena, I once tried tofu pasta too...never again! 8 bucks a pack??!?!?! What a ripoff! And they weren't even good to top it off? 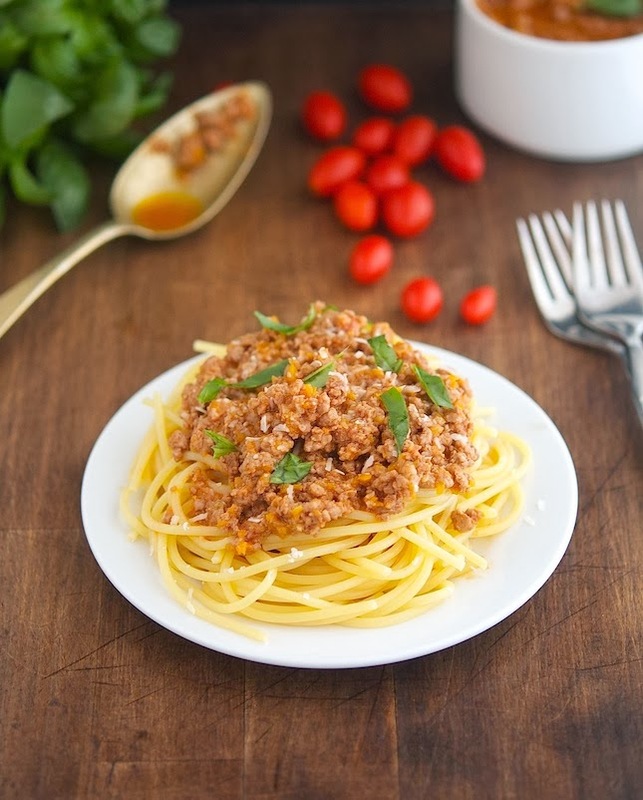 Plus, you went all out to make this amazing genuine Bolognese? Pffft. Bet you were rather displeased. I know I would have been. I am yet to go get myself a crockpot..can't imagine I don't have one. That said, this sauce and the dish go so well together and looks pretty darn delicious and a hearty meal. You NEED a Crock-Pot Asha, it's life changing! What beautiful pictures! I love a good bolognese sauce, thanks for sharing! Have you ever tried the Tinkyada rice pasta? It is wonderful! Stays firm and does not get mushy like the Quinoa pasta. Also we've recently discovered that the Archer Farms brand at Target has a great gluten- free spaghetti. You can hardly tell the difference from the real deal. It cooks up beautifully. Thanks Sue for the tip, I'm definitely going to look out for Tinkyada rice pasta. I've never tried it before and it sounds really good. when does the milk get added? hope you respond soon...i'm cookie the veggies already. "Add meat, diluted tomato paste, 1 cup of beef stock and milk to Crock-Pot."